DONE! Ahh. I love that word, don’t you? Too bad it so rarely happens in this house. Anyway, I am here to simply report that the trim— also known as “window casing”— that I’ve been meaning to add to the living room windows is finally up and nailed into place! It’s not a large or complicated project by any means, but considering I’ve been having to step over a pile of window casing in my hallway since before Christmas, I’m glad to get rid of… well… I guess not very much of it. There’s still a pile, only less contained in plastic wrap, since I bought enough to finish off the rest of the upstairs rooms as well (purchasing in bulk = bulk discount). Getting the casing up does have some significance though: it means that every window on the first floor of the house now has completed trim, and that’s a pretty nice line item to draw through on my to-do list! Since family members have helped me with this type of project in the past, I did this one solo and snapped a few pics with my phone as I went, just so that I could share a few things as I knocked it out. This was in a bay window, so I first shoved all of the furniture that I positioned there during Christmas out of the way to make more room for the air compressor and ladder. The new tree had some difficulty getting boxed up in its original package, so it’s hanging out in the middle of the living room until I get a bin large enough for storage (classy, I know). 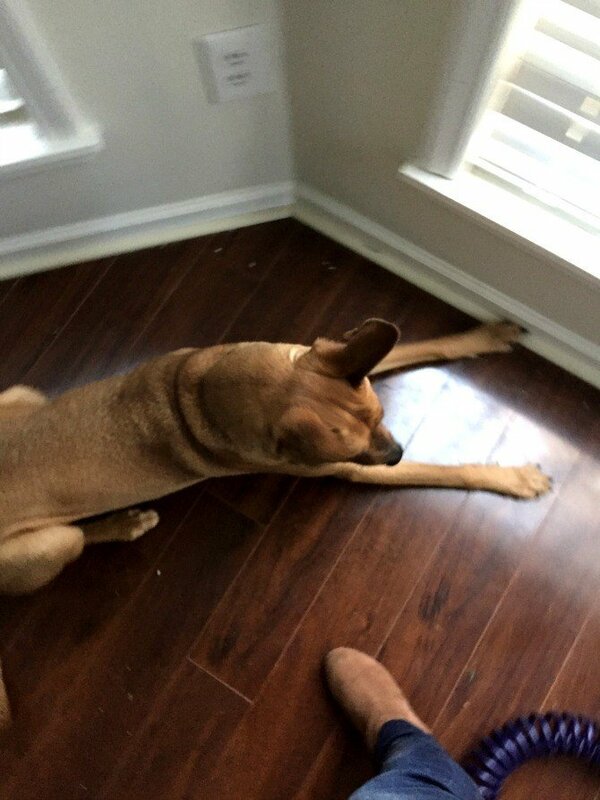 As always, my trusty project supervisor was around to make sure the job got done and sit precariously under my feet at all times. This is an easy project because it doesn’t involve a lot of complex math; I just measured the length of each window and made sure to remind myself that it’s the shorter part of the 45-degree angles, then fit the top piece into the void that creates. Because I had a cold and I’ve started to notice how dry my throat was getting, I wore a mask pretty much the whole time I did this project. 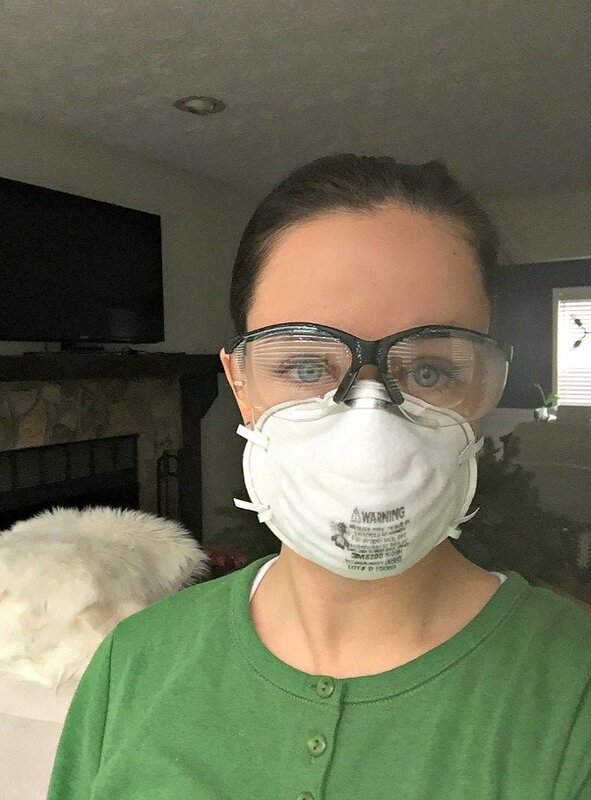 I’ve noticed that if I even have the slightest bit of a cold looming not to chance it with the sawdust (I mean, you’re supposed to wear the mask anyway for safety while cutting, but I guess I take special notice of it when I know how miserable I’ll make myself the next day without one). For a project like this, I needed just a few tools: a miter saw (doesn’t even have to be a compound miter, mine isn’t), a tape measure, a pencil, and a nail gun with finishing nails (I typically have 1″ and 2 or 2 1/2″ varieties strewn about the house during various projects, so I used the longer ones for this). I also eventually grabbed a small putty knife. 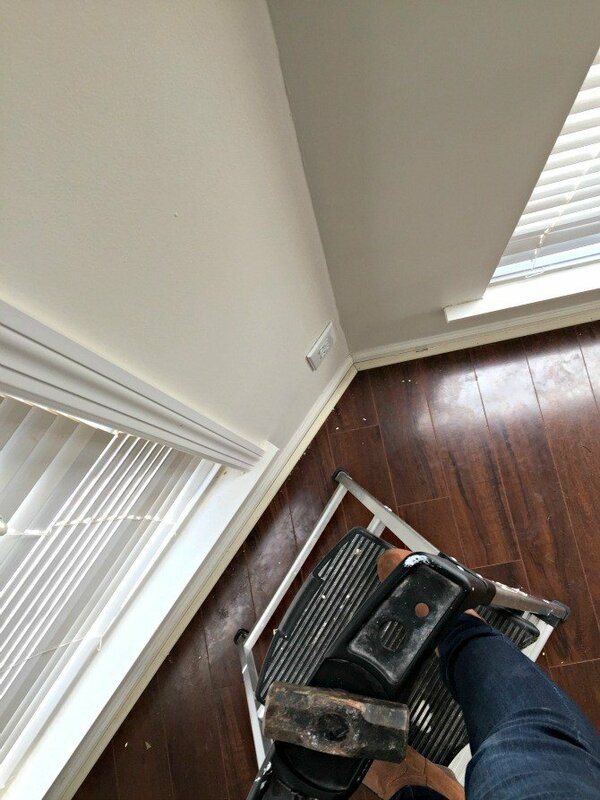 Brad nails can work too for something as lightweight as door/window casing, but for anything heavier like baseboard or crown, it’s recommended to use finishing nails. 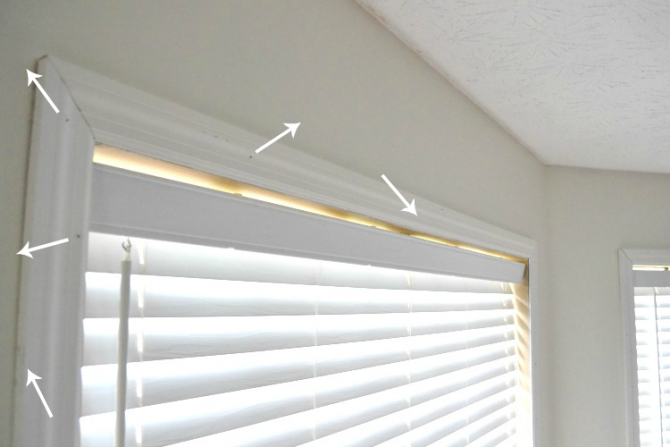 During one of my first years attending the Haven Conference, my pals Sandra and Brittany did a crown molding class where I learned that a nifty trick to make sure the molding would stay put for the long haul was to drive the nails in opposite angles as you nail along the trim. Meaning, drive one in a slightly upward angle, the next downward, the next either upward again or to the left, and so on. The lack of being able to pull them all out in a single direction prevents the trim from simply reversing straight out of the holes you’ve just created (walls and windows flex and shift over time and temperature, so it seemed like a good idea!). My walls and windows are super uneven and bumpy in places (especially the corners), and that led to a lot of problem-solving on the fly. For example, a heavy mallet helped to flatten out uneven bits where the previous owner had unsuccessfully patched and painted over lumps from (I assume) worn-out nail holes of previous window treatments. Sure, it caused some cracks in the surface of the paint when I got aggressive, but all of that got covered over by the new (and flatter-positioned) trim, so it’s not visible. 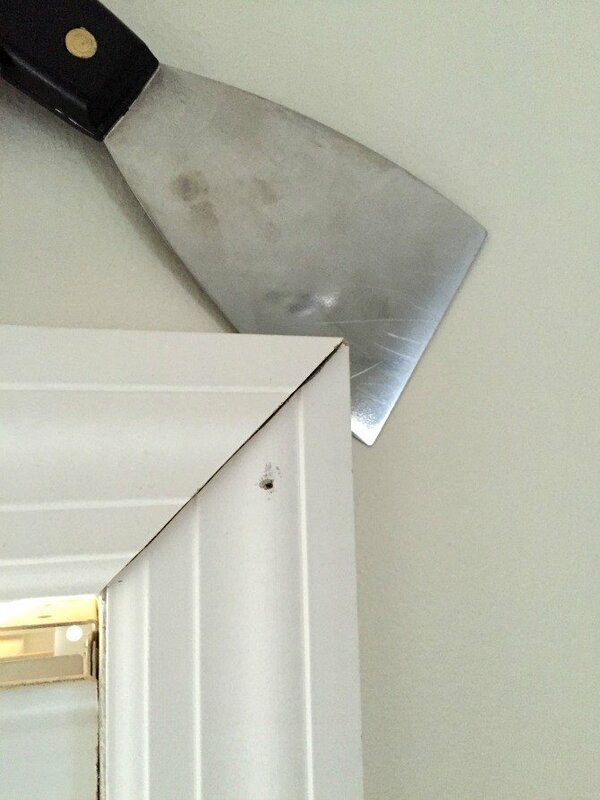 Because of uneven drywall lumps, there were moments when the top piece of trim wouldn’t 100% line up with the side pieces (one would sort of “sink” into the wall more than the other). I either wouldn’t notice this prior to trying to install or the mallet didn’t get it completely flat, so I still had to finesse things a bit. This was when I grabbed a putty knife to slide under the trim and edge the sunken one out a bit to be flush with the other piece. Once I got the nails in, things stayed secure, but cardboard drywall shims (or just a random thin piece of cardboard if you live in a house like mine where it seems to multiply on its own) can also help to add a little something behind the uneven piece and bring it forward (usually this is far easier than trying to smack the one jutting out further against the drywall… you’d risk damaging the trim). 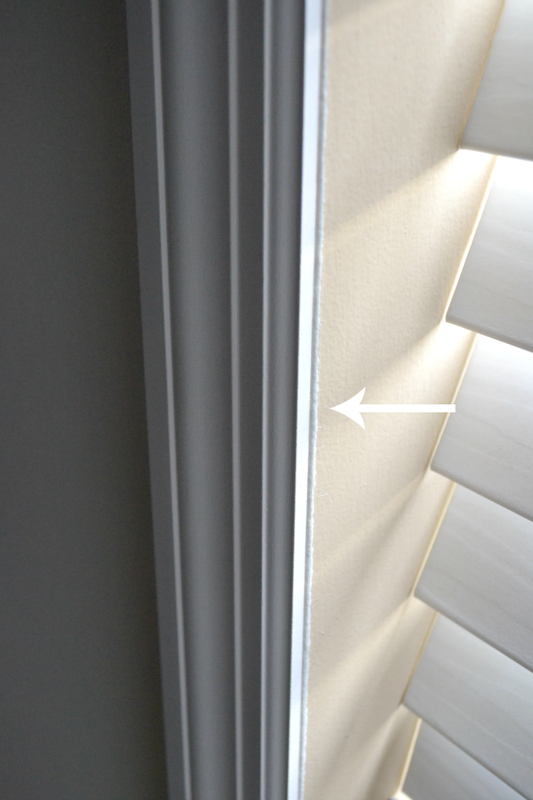 I also wound up edging the trim ever so slightly off from the edge of the window where it met the drywall. I mainly did this because I knew that the line itself wouldn’t be straight all the way down from the top of the window to the bottom, and this gave me some wiggle room. Once it’s all caulked and painted, the edges won’t be noticeable at all. I debated for a bit on whether I should try installing the trim in order of SIDE-TOP-SIDE or SIDE-SIDE-TOP (the bottom sill pre-existed on all windows), and I eventually figured out that it was far easier for me to get both the left and right sides done and then insert the piece on top (less measuring and math). Much like with crown, cutting the longest pieces first is a decent way to go. Speaking of sides, I found that once it came time to fit the piece on top, it worked out best to cut one 45-degree angle on the harder-to cut end (since I’m right-handed, cutting the angle on the left side of my miter saw made for a more awkward cut since my saw opens to the left and obscures the blade a bit as I’m cutting) and then make adjustments from the other, easier-to-cut side. And ONLY to make cuts on a single side of the trim rather than confuse myself and cut the wrong end. If you try this yourself, remember that it’s always easier to cut a piece that’s slightly too long and trim off a blade’s width at a time to get it to fit rather than trying to get it right on the first try and coming up short (small brag: I managed to get an exact cut on the first try twice, but it was purely by accident because I thought I was cutting it slightly too long and wound up being wrong… so just goes to show you that cutting slightly longer than you think you need is better!). Next steps are to of course fill in holes and caulk everything (and then add a few curtains), but it’s a nice accomplishment for a week where I nursed a cold and really didn’t feel like getting off the couch! What have you been up to this week? I remember that class from Haven! I still have the photograph of the angles for crown molding! 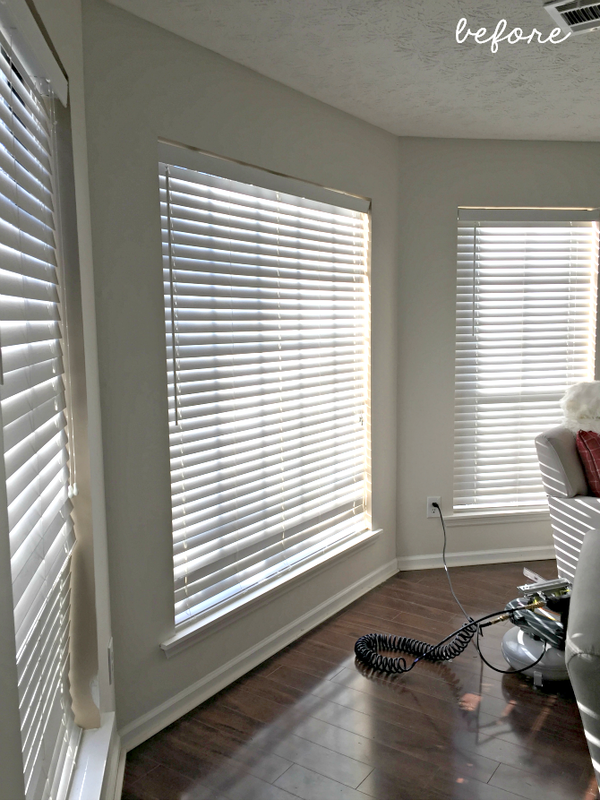 Nice work with the windows – the trim makes them fully dressed. Looks great! 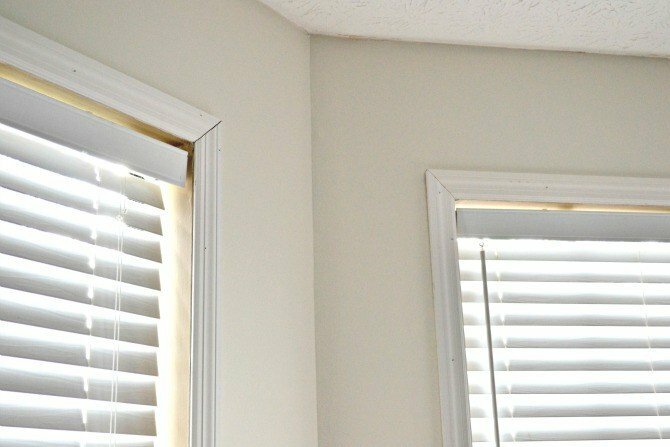 I plan to build up the top of my window casings to match the trim I did around the very wide opening between living room and dining room. One thing I’ve learned using my miter saw is to take the width of the blade into consideration. Makes for less “blade width” trimming … usually. ? Nothing better than the feeling of completed project – especially when it turns out this great. Looking forward to seeing your next project. So glad to see this. 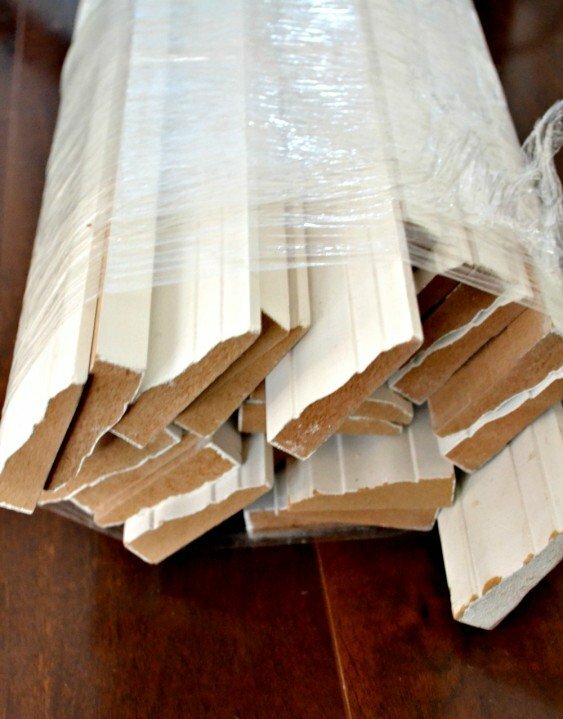 I was just thinking of adding some chunky trim to my windows that look exactly like your before. I was a bit nervous, this has me excited to tackle ours. Spackling work best for those “larger” gaps. I’ve found that caulk works best for the smallest of the small gaps/cracks. Get siliconized paintable caulk, Such as; DAP Alex Plus as opposed to just Alex. I like the Sherwin Williams brand the best (especially for areas likely to see expansion and contraction like where a vinyl window meets the drywall or wood jamb) for ~$1 more. Good tips. I use DAP as well, but not Sherwin-Williams. I just don’t like their lack of convenient locations or store hours (Behr and Olympic have proven to be great paints for people on a budget like me, and I almost always run out at like 9PM!). Great job! 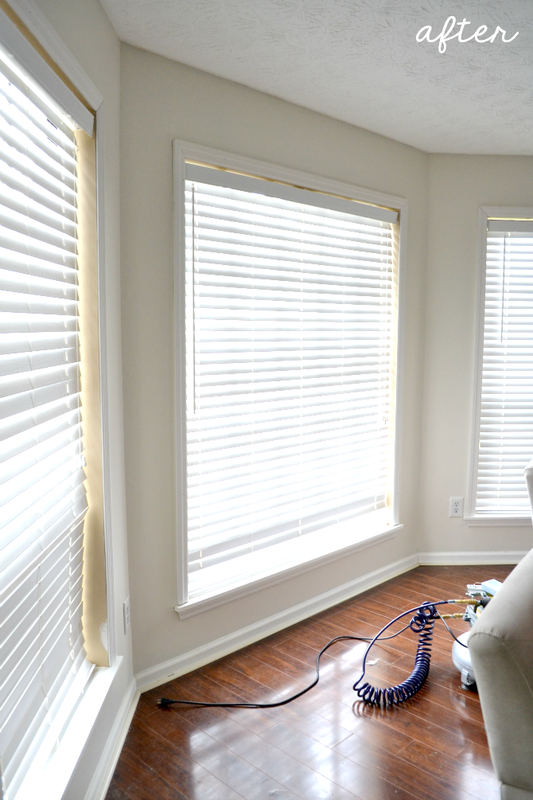 We just framed some windows in our home office and it makes such a huge difference in the room! 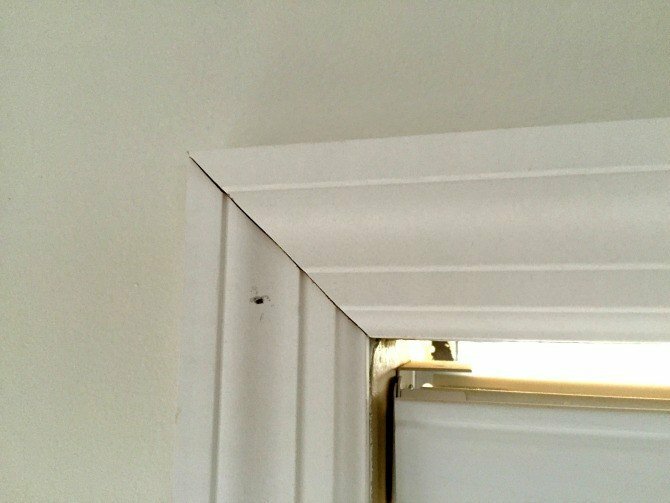 I want to rebuild my window trim in my bathroom but the miter cuts skeer me! You did a good job with yours! Thankfully, my miter saw has a sort of “click” lock at 45 and 90-degree angles, taking the guesswork out of cuts on a project like this. It’s a great beginner project too, so give it a try (worst that could probably happen is you mess up the first few cuts, but you’ll get the hang of it). If you’re at all shy with the miter saw, you can also try a miter box; it will take a little longer to saw manually, but the results will be the same. I don’t think the difference is subtle at all! It looks lovely! Wow great job! I live in the UK and your blog is very inspirational for helping me go and do research and just giving projects a go (although nothing nuts like re-wiring or anything electrical!). It seems much more common to trim windows in the States than it is over here, but I so buy in to how it makes them look more complete. 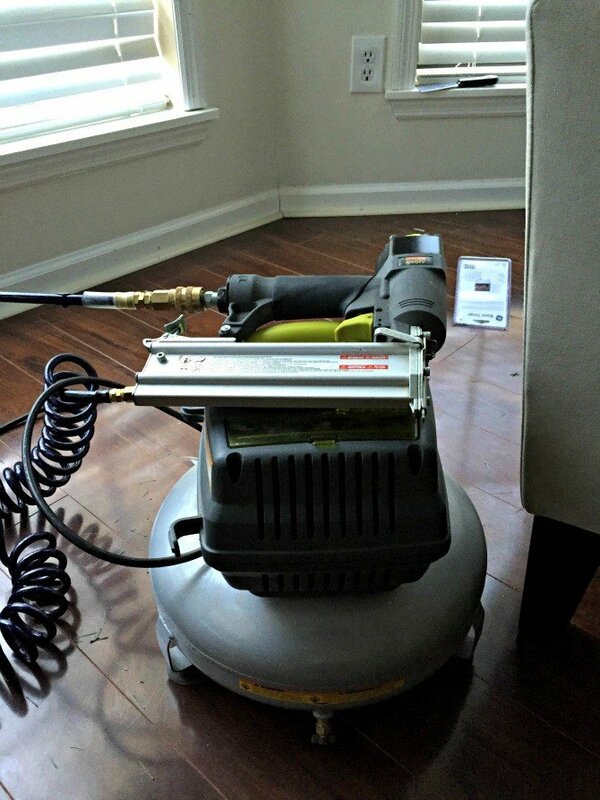 As soon as I have a nail gun and a mitre saw it’ll be on my to do list! Lovely work. It looks so much more elegant finished. It is hard work, but you will cherish it for years and your friends will be astonished. Did that sound weird? I don’t care, because I do ! Thank you so much for this post, you are amazing! Thanks for sharing this fantastic post! 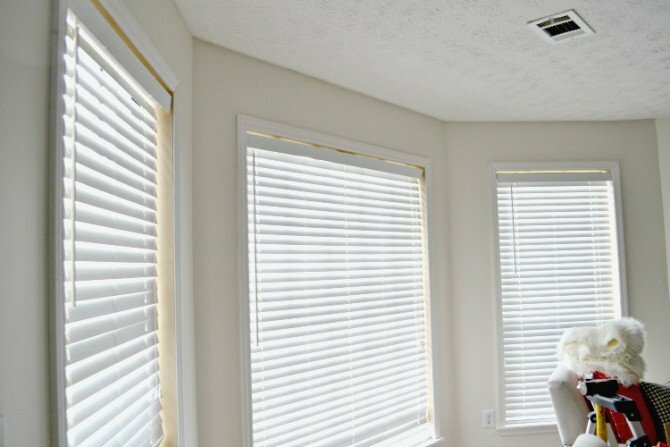 I love your before and after picture because even though it wasn’t a huge addition, the trim makes it look so much better! I don’t have any trim around my living room windows, and I’ve been thinking about doing it for a while now. Looking at the results you got, I’ll definitely look into doing that soon!